Black Friday: Get a Gift for You! For each holiday gift you send from The California Wine Club today only, while supplies last, you’ll get a free bottle of Gnekow Family Winery 2010 Campus Oaks “Old Vine” Lodi Zinfandel, the most popular wine we have ever featured. See Gifts Now! Click here or call 1-800-777-4443. I'm enjoying a quiet day after Thanksgiving at home today, savoring memories of yesterday's feasting and sharing thanks and gratitude with friends. No fighting the crowds at the local malls for me! But okay, all right, I admit it ... I did go online and look for some good reading material about wine and other things. Since our WineLovers Discussion Group is just now wrapping up our Wine Focus on the Wines of Piemonte in Northwestern Italy, let's have a look at some good, solid books and other resources on Italian wine. You can find them at your local book stores if you're out and about, or take it easy and jump online to order them from home. Further, these three recent books about Italian wine are well worth your attention. Not budget volumes, they are priced in the $30s range as content-rich references for serious wine fanciers and professionals. Each listing includes a link to buy from Amazon.com. If you choose to buy and are kind enough to use these specific links, we'll get a small commission to help us pay the rent for WineLoversPage.com, our forums and, of course, The 30 Second Wine Advisor. Thanks! 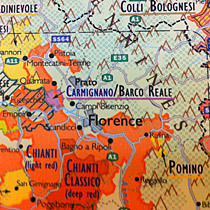 Brunello di Montalcino, Understanding and Appreciating One of Italy's Greatest Wines, by Kerin O'Keefe, is organized as a guided tour through Montalcino’s geography, this essential reference also makes sense of Brunello’s complicated history, from its rapid rise to the negative and positive effects of the 2008 grape-blending scandal dubbed “Brunellogate.” O’Keefe also provides in-depth profiles of nearly sixty leading producers of Brunello. Order it now from Amazon.com for $33.79. Nicholas Belfrage's The Finest Wines of Tuscany and Central Italy: A Regional and Village Guide to the Best Wines and Their Producers (The World's Finest Wines), have enjoyed acclaim since long before Leonardo da Vinci, says Amazon.com's review; and they are at the forefront of the remarkable renaissance of Italian wine over the past 30 years. Wine trader and writer Nicolas Belfrage brings Tuscany's story up to date, from geology and geography through grape varieties and the latest research into Sangiovese, the region's classic red grape. Order it now from Amazon.com for $32.28. Best Italian Wines Annuario, by Luca Maroni, presents the best of Italian wine production, focusing on superior quality wines, basing its ratings on Maroni's personal tasting method based on the principle that the "Quality of a wine equals the pleasantness of its taste." Order it now from Amazon.com for $36.89. For each holiday gift you send from The California Wine Club today, you’ll get a bottle of the most popular wine we have ever featured: Gnekow Family Winery 2010 Campus Oaks “Old Vine” Lodi Zinfandel. Each gift month features two handcrafted, award-winning wines and an insider’s look at the featured winery with Uncorked®. Minimum 2-month gift purchase required to qualify for gift bottle. Offer good only Friday, Nov. 30, 2013. Offer only valid while supplies last. See Gifts Now! Click here or call 1-800-777-4443. FOOD MATCH: Fine with red meat, poultry, pork, sharp cheeses or robust veggie main dishes. It was excellent with a dinner of creamy polenta topped with an autumn harvest ragù. WHEN TO DRINK: Like its Northwestern Italian neighbor Dolcetto, Barbera is intended for early drinking while it's young and fresh, to be enjoyed while waiting for the more magisterial Barolos and Barbarescos to age. Enjoy it soon, but don't worry about it going around the bend, as a good Barbera should last for six to eight years past the vintage..
VALUE: It's a good wine, but $20 felt a little pushy for Barbera d'Asti. A qiocl check at Wine-Searcher.com bears this out, showing many offerings in the mid-teens. Bersano's main page, available in English and Italian, is just a little too ad-agency fancy for me, with its embedded music and pop-up pages. Try this link to go direct to the mini-page that promotes the Costalunga Barbera d'Asti in English. 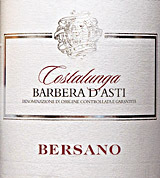 ompare prices and find vendors for Bersano "Costalunga" Barbera d'Asti at Wine-Searcher.com.